Look and feel your best on the stage or competition floor! These uniforms are custom made for each order. These special order uniforms take about two weeks before shipping. If you require special sizing, please select "Customer Size" and contact us to provide the size details. If you have any questions or special requests please contact us. Matching shawls are available (sold separately). Please see Shawl Series for our available shawls. All custom uniform delivery time 6-8 weeks. 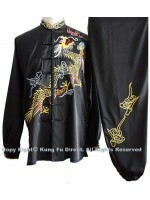 *Brought to you by KungFuDirect.com, partnered with Han Ding manufacturers, we are the only providers of these uniforms in the United States. Han Ding is located in the Henan province, the place of origin for Chinese martial arts. All uniforms are the top of the line quality for Chinese competition style uniforms; many national and world champions wear these uniform styles for their winning performances. Please refer to our diagram below for measurement details. Please carefully select the proper size; no returns are accepted for these uniforms. Different Colors and Styles: Gradients, 2 Tone, etc. Different Neck styles: 3 button, 7 button, Open, etc. Embroidery options: different designs, art, and textures.